Abbot Jeremias Schröder, O.S.B., a member of the synod of bishops that concluded on Sunday in Rome, told America on Oct. 21 that the relationship of the church to modernity and its own history were “overarching issues” of the synod. 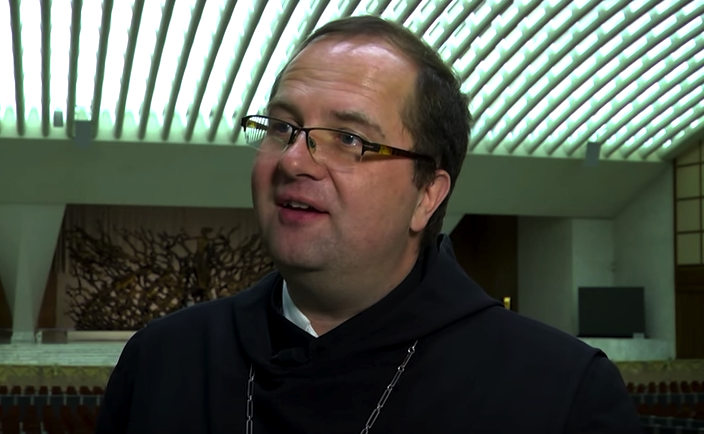 Abbot Schröder, 50, is the abbot-president of the Congregation of St. Ottilien, also known as the Missionary Benedictines, a group of about 1,000 members in 20 countries. The synod of bishops, which met in two sessions a year apart, sought to advise Pope Francis on the vocation and mission of the family in the church and the contemporary world. On Saturday, all 94 paragraphs of the final document won at least two-thirds support from synod members. Now it is expected that Pope Francis will issue an apostolic exhortation on the topic in the coming months, as is customary following a synod. In the interview with America, Abbot Schröder described several challenges facing the synod and the church, including the “considerable differences” among synod members on a number of important issues, the “discrimination” of women within the church and the restrictions presently placed on divorced and civilly remarried persons in the life of the church. Now it is becoming “very clear,” Abbot Schröder said, that the unity among the bishops “really needs the strengthening hand of the successor of Peter to give it a shape,” otherwise the enormous diversity would make it “almost impossible” to arrive at a practical result or unified position. One issue that came up repeatedly in interventions and small group discussions at the synod was that of violence against women within families. The “Instrumentum Laboris,” the working document of the synod, noted that a “greater appreciation” of the responsibility of women within the church could be a “contributing factor” toward their improved status within society. Asked about the possibility of ordaining women to the diaconate—as suggested in an intervention by Archbishop Paul-André Durocher, Abbot Schröder said the topic has come up “repeatedly” and that it seems to be “one plausible way”—though not the only way—to move forward on the question of women in the church. He referenced the revision that Pope Benedict XVI made to canon law in 2009 which clarified the distinction between the ordination of bishops and priests who act in the person of Christ the Head, and the ordination of deacons into the ministry of liturgy, word and charity. “To me that seemed as if some people are trying to prepare the church to open the door in that direction,” he said, while also acknowledging he could be “misreading” it. In an interview with Vatican Radio on Oct. 21, Abbot Schröder called Archbishop Durocher “very courageous” for even raising the possibility of the ordination of women as deacons. “A lot of people get into trouble when they start talking about the ordination of women,” he explained. You can be “punished severely…with quite existential consequences” for moving in that direction. He added that the intervention by Archbishop Durocher was “heard and understood and appreciated by some” at the synod, but to his recollection “it is not something that the synod in any way took up, either positively or negatively,” since the synod had to deal with so many issues related very directly to families. Abbot Schröder acknowledged “a big step forward” for the synod with the presence of Brother Herve Janson, the superior general of the Little Brothers of Jesus, as the first lay voting member in the 50-year history of synods. “We sorely missed them, especially Wuerl,” he explained. Abbot Schröder said he thinks Pope Francis’ hope is that the synod will “do something positive for families.” In terms of pastoral approaches, Abbot Schröder expressed concern that divorced and civilly remarried Catholics presently experience a number of restrictions in the church, like serving as godparents or on parish councils. “At least some of these restrictions should be removed,” he said. “What we now consider to be eternal truth was really only formulated at Trent, and that’s not understood by many synod fathers." Rem acu tetigisti! A major problem the RCC has - among others - is the theological illiteracy of too many among its leadership. The way you hear some of them talk, especially about how the church uses the Bible (eg the notion that Jesus gave us a rule about divorce and remarriage), you would think they are a bunch of fundamentalist southern Baptists. It's embarrassing. I wish there were some way this issue could be addressed. But I suppose that won't happen until a good number of the diocesan seminaries are majorly reformed (or closed), including the North American Tap Dance College. This is a very, very powerful interview with a very, very prayerful Synod father who connects the way women are treated in the world with the fact that the church refuses to say--strongly and symbolically--that women can image Christ, that women are made in the image and likeness of God. This is all very interesting, but falls far short of the most important event of the Synod; I refer to the Canonization of Mr. and Mrs. Louis and Zelie Martin, the parents of Ste. Therese of Lisieux, a week ago last Sunday, as a Married Couple. the importance of this Canonization cannot be overstated, in view of the secular attacks on the institution of marriage and the Sacrament of Matrimony. The Spirit has given us a specific and concrete example of the marital ideal, and a practical intercessor for married couples who find themselves beset on all sides, by attacks on their status and vocation, which can be classed only as diabolical in nature and ferocity and hatred. It was no surprise that the secular press all but ignored this event, but most embarrassingly the Catholic Press also turned this glorious event and its celebration into a non-event. Shame!!! !